A new bank offering the Islamic finance banking concept — which works on the basis of risk-sharing instead of interest — opened in Seychelles on Saturday. Once the legal framework is approved by the National Assembly, Al Salam bank will be the first in Seychelles to offer Islamic Sharia-compliant products and services. The bank is located at the Maison Esplanade in the capital, Victoria. Contrary to conventional banking, “where you lend money and earn interests on the amount, in Sharia-compliant banking, the bank becomes a partner. Once the company starts making profits, this will be shared with the bank,” said the bank’s Chief Executive Asim Kumar. “The major difference is that we will not have a fluctuating rate. Our rates will be fixed but they will be very competitive,” he added. In Sharia-compliant banking “there should not be a penalty so if there is a penalty, the money goes to charity. The bank does not keep it for its own benefits,” explained the Chief Executive. 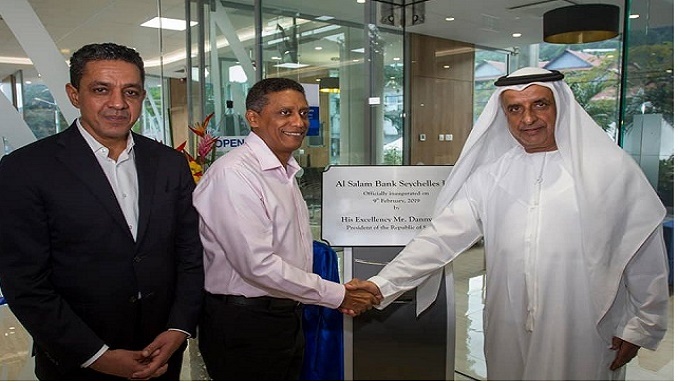 Al Salam Bank Seychelles is owned by Al Salam Bank of Bahrain, which owns 70 percent of the shares while a local company, Seychelles Pension Fund, owns 30 percent. Kumar told SNA that the bank needed a strategic local partner to start its onshore banking service. “We spoke to the Seychelles’ government and the Central Bank of Seychelles and told them we were looking for a financially strong local partner which could help us in getting business. Seychelles Pension Fund was very interested and we grabbed this opportunity,” he said. Al Salam Bank Seychelles offers retail and corporate banking. The bank is presently focusing on corporate and small and medium enterprises. Personal Banking will start once the legal framework is in place. The Cabinet of Ministers has already approved the policy and strategy on Islamic Banking and Finance, as part of the financial sector development plan for Seychelles, an archipelago in the western Indian Ocean. The legal framework is yet to be approved by the country’s National Assembly. Al Salam bank “will be the first and only bank to provide Islamic banking services in Seychelles as soon as the Islamic banking environment is operationalised,” said Loustau-Lalanne, the Minister for Finance, Trade, Investment and Economic Planning. Loustau-Lalanne added that Seychelles has a well-established and strong trade relationship with Gulf countries. “Al Salam Bank’s presence here will reinforce and better serve our local business community especially micro, small and medium enterprises which constitute the bulk of businesses in our country,” said Loustau-Lalanne. Kumar said that for now, the bank can only own movables such as equipment and vehicles. Prior to launching onshore banking, the bank has been offering offshore banking since 2016. It was formerly the Bank of Muscat International Offshore (BMIO), which was taken over by the Central Bank of Seychelles in 2014, following the breakdown of the bank’s foreign corresponding banking relationship. Al Salam Bank of Bahrain became the new shareholder of BMIO after it acquired BMI Bahrain in 2014. It has 25 employees — 23 locals and two foreigners.